After seeing Jeff Pershing's post on a obfuscated madelbrot renderer in python I naturally had to try the python snippet provided. Sitting on a quad-core 3GHz machine I felt a bit disappointed when it took a long time to render the fractal and only one core was used. Performance was not a part of their initial goals so I will forgive them but I felt obliged to make a multi threaded version. For science! Said and done, it was surprisingly smooth coding and the end result is pretty decent. The palette was by far the most time consuming thing to implement, it's hard to find good colors. 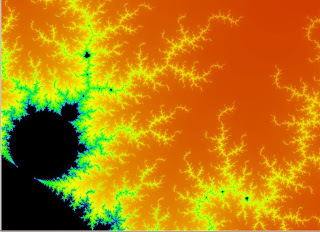 Only basic controls for navigating the fractal are implemented, mouse wheel to zoom and click to center. The code can be found at my repository on bitbucket.